We can think of redirects as link shortcuts that you can use anywhere on the internet. They are especially useful for Twitter, with it’s 140 character limit. Cache page URL’s tend to be long and complicated, no matter which website. Lets do a search for Washington, D.C. for both Geocaching.com and opencaching.us; the first cache that comes up has a URL of http://www.geocaching.com/geocache/GC2E52_mile-zero and http://www.opencaching.us/viewcache.php?cacheid=150 respectively. Using the services of coord.ch, and knowing the Waypoint name (often referred to by many cachers as “the GC number” on Geocaching.com caches), we can shorten those links to coord.ch/GC2E52 and coord.ch/OU0096 respectively. And you don’t even need an http:// and/or a www; for reasons we won’t get into in this post, but trust us, you don’t need them. The .ch in coord.ch is the top-level domain (or TLD) for the Country of Switzerland in the Domain Name System of the internet. We have included a screen shot of the coord.ch website at the bottom of this post for reference. This free service for Geocachers everywhere was created in August 2010, and can be traced to this user on Geocaching.com, and posts to the Geocaching section of his personal blog. You might note that both the coord.ch website, and his blog are in German; so we figured he probably wasn’t very fluent in English, and we didn’t even attempt to contact him for this blog post. As you can see from the screen shot below, these redirects work for all the OpenCaching sites, including that one we’re not affiliated with, as well as Terracaching.com, Geocaching Australia and Navicache.com. Geokrety’s, the forever free OpenCaching network equivalent of Travel Bugs, are also supported. 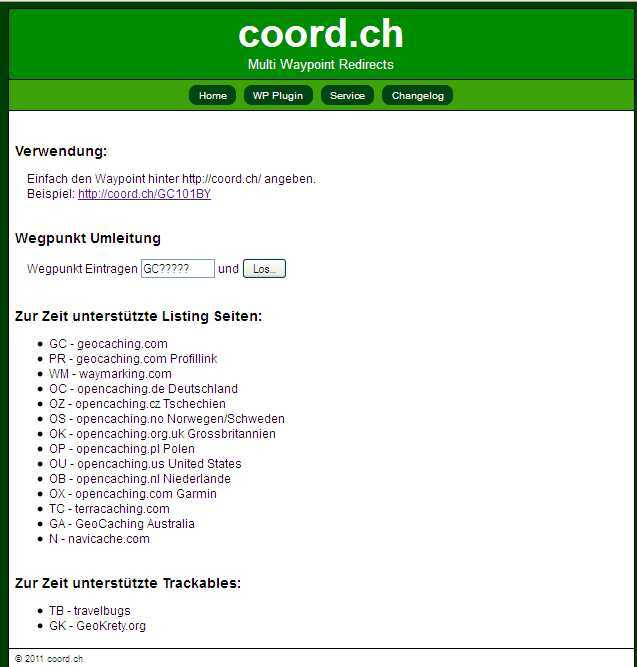 Coord.ch does everything coord.info does, and much more. Give it a try!